Personally, I think I’ve got a pretty good approach to finding great Italian value wines. It boils down to a few key principles: Choose local varieties, rather than international ones like Cabernet and Chardonnay; head to lesser-known regions, rather than paying a premium for well-known names; and if you end up in a famous region, go for the less-famous types of wine. But suppose there were some sort of Italian-wine super-genius out there, with value-picking skills I couldn’t even conceive of? It would be like thinking you were hot stuff at tennis, then finding yourself facing off against Roger Federer. 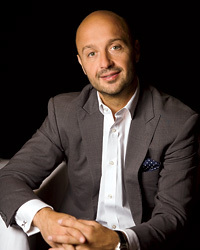 To find out, I decided I should go mano a mano—or vino a vino—with Joe Bastianich. Joe was the perfect opponent. He’s written two books on Italian wine (most recently Grandi Vini: An Opinionated Tour of Italy’s 89 Finest Wines); owns wineries in Friuli, Tuscany and Piedmont; and, with this issue’s guest editor, Mario Batali, owns several of the country’s most acclaimed Italian restaurants, including Del Posto in Manhattan and Osteria Mozza in Los Angeles. He’s been an expert wine-bargain hunter since he opened his first restaurant, Becco, in 1993; it has a list devoted to amazing values. My plan was simple: See if Joe was game for an Italian-value-wine smack down. He’d pick six bottles priced at $15 or less, I’d pick six, and then, it occurred to me, I could ask his mother, chef Lidia Bastianich, to decide the winner. Lidia is a star chef on TV, the owner of NYC’s legendary Felidia and the author of several classic Italian cookbooks. But she also knows wine; after all, she’s been pairing Italian wines with her cooking since before Joe was born. She was an ideal judge. Still, on the off chance she might feel any bias—for instance, toward her own son—I decided my odds would be better if we tasted the wines blind. I also asked Joe not to bring any of his own wines, partly to make it tougher for him, and partly (and, I admit, shamelessly) because his $15 Bastianich Friulano is basically unbeatable at the price. Both of them said yes, which brought us, together with six pairs of paper-bag-covered bottles, to the F&W Tasting Room late one Wednesday afternoon. To give the taste-off some structure, Joe and I had each chosen one sparkling wine, one northern Italian white, one central or southern Italian white, and a red wine each from northern, central and southern Italy: a picture of the entire country in six wines. For my first wine, I’d selected a Lambrusco, the dry red sparkling wine of Emilia-Romagna, from a small producer named Lini. I love the way Lambrusco combines the effervescence of a sparkling wine with the body and flavor of a red wine, making it a fantastic partner for food. As it turned out, Joe had chosen Lambrusco, too. “I thought I was being original!” he said. His was the Cleto Chiarli Pruno Nero, made, like my wine, from the Grasparossa grape variety. He’d brought it from Eataly, the extraordinary Italian market he opened in New York with Batali and Italian entrepreneur Oscar Farinetti about three years ago. Lidia liked both wines. “But if you’re talking about food, I prefer this one on the right,” she said. “There’s better acidity, more complexity.” The one on the right turned out to be the Lini I’d brought. Score one for the home team. Unfortunately, the tasting of whites from northern Italy did not go as well for me. It was instantly clear that one wine was a knockout, while the other was a bit modest in comparison. Joe and I both knew without seeing the labels which was which: mine, modest; his, knockout. I was halfway ready for Joe to trash my wine—as anyone who’s read his recent memoir, Restaurant Man, knows, the guy doesn’t mince words. And I was ready to defend my choice: A blend of local white grapes from the Veneto’s Maculan winery, the wine was graceful and appealingly fragrant. But I had to admit, the Scarbolo Pinot Grigio he’d brought was even better (and Lidia agreed). Most affordable Pinot Grigios are pretty anemic, but Valter Scarbolo’s is gorgeously textured, layered and delicious, and still only $14. The lesson here: When it comes to Pinot Grigio, picking a great producer is crucial. And who won? Neither of us. We ended in a dead heat, three all, which I guess means there is no secret, super-genius strategy for picking Italian value wines. (Or else Joe and I are both super-geniuses, which is a nice idea.) One takeaway, though, was that all the wines we brought would be fantastic with food—something made clear by having Lidia there as our judge. “I’m a food person,” she said, and with each wine, she described what she’d serve with it: sole rollatini with Falanghina, braised lamb and olives with Montepulciano, rabbit with peppers for Barbera. By the end of our tasting, I was starving—and I was lucky. 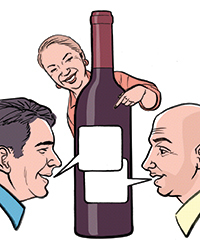 Imagine if I had taken down Joe Bastianich in a wine challenge judged by his own mother. Babbo, Del Posto, Felidia—forget about it. I’d be lucky to get a reservation at the local Olive Garden. The bottles Joe and I picked represent a cross-section of Italy’s wine regions. Lidia’s favorites are marked with an asterisk. 2009 Lini Labrusca Lambrusco Rosso ($15)* A brisk sparkling red from one of the best traditional Lambrusco houses. NV Cleto Chiarli Pruno Nero Lambrusco Spumante ($15) Bright, fruity, and in the end, “more of an aperitivo,” Lidia felt. 2011 Maculan Pino & Toi ($12) Pinot Bianco, Pinot Grigio and Tai (hence the name) are blended to make this aromatic Veneto white. 2011 Scarbolo Pinot Grigio ($14)* One of the best wines of the tasting, with far more depth and complexity than most Pinot Grigios. 2011 Feudi Di San Gregorio Falanghina ($15) Feudi’s Falanghina is a bit more lean and tart than the Terradora bottling. 2009 Clavesana Dolcetto Di Dogliani ($15) “Very elegant,” Joe admitted about this graceful, light-bodied Piedmontese red. 2010 Fontanafredda Briccotondo Barbera ($15)* A berry-rich red from a storied Piedmont estate, it’s an extraordinary deal. 2011 Valle Reale Vigne Nuove Montepulciano D’Abruzzo ($13) Lidia would pair this Abruzzese red with pasta in a spicy tomato sauce. 2009 Cantina Di Santadi Grotta Rossa ($14) This peppery Carignane “beautifully expresses where it was made,” Lidia said. 2010 Tormaresca Neprica ($12)* Braised meat sauces would go perfectly with this ripe red blend from Puglia, Lidia suggested.